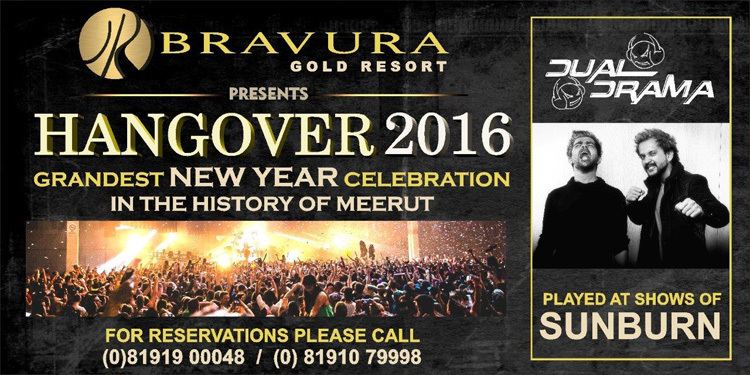 Bravura Gold Resort, Meerut after the grand success of New Year - 2015 Party, presenting New Year Grand Party (Hangover - 2016) with more than 100 assortments of Live Counters, Snacks, Mocktails, Main-Course, Salads & Desserts. Celebrity DJ (Dual Drama), Professional Sound & Display. The Resorts has warm & natural ambiance and enjoys the Top Rating on Trip Advisor. It has all the facilities from SPA, GYM, Amusement Center, Restaurants, Bar etc. Enjoy the New Year Party at Bravura Gold Resort with the convenience of easy access to Delhi / NCR, located at NH 58 highway. Free from Hustle & Bustle of the city.